Santrauka: The story of the endeavour, courage and determination of Tracy Edwards, a 27 year old skipper, who with 11 other yachtswomen embarked on the Whitbread Round the World Yacht Race. The book describes the all-woman crew's nine-month, 32,000 mile voyage. Launched by the Duchess of York, who has maintained an active interest in the project, the appropriately named Maiden risks the many traumas of this most gruelling of challenges. But Tracy maintains that brains are more important than brawn and her past success back up her words. Already she and her crew have competed in a trans-Atlantic race in September 1988 - and won. 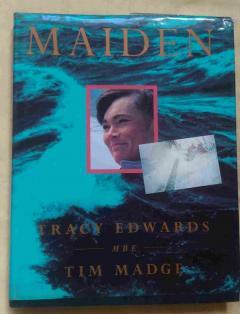 And Tracy took part in the last Whitbread Race, when she was only 22 years old. Now Tracy is skippering her own yacht and, if she succeeds, it will be a first for women, a first for Britain - and a triumph for her. From the start line to the finish, Tim Madge follows Tracy's progress - the successes and traumas - and we learn how her dream came about, her own story and those of the people who know her.